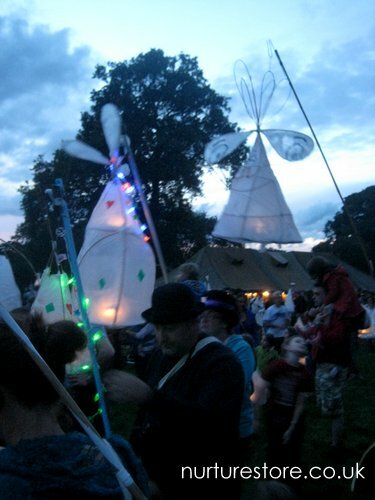 One of the highlights of the Just So festival is the paper lantern parade on the Saturday night. 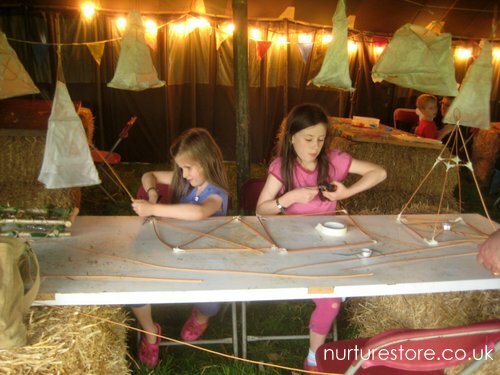 All day on the Friday and Saturday families had been busy in the mess tent, weaving, gluing and sticking to make lanterns from a combination of willow and tissue paper, and by the Saturday night 360 paper lanterns had been made for the evening parade. The lanterns are easy to make and are a magical craft for the winter solstice, Halloween or Bonfire Night. 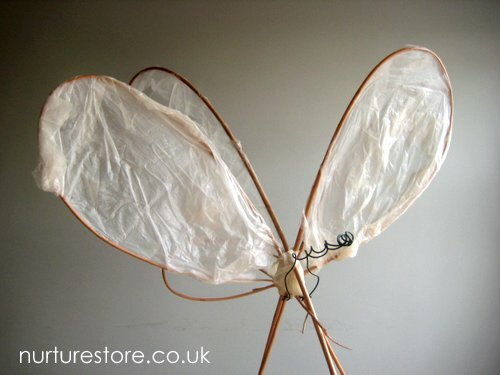 You’ll need four long lengths of willow to make the frame of your lantern. Using the thicker end of the willow, cut four pieces to make a square frame. Fasten the willow together with sticky tape, and reinforce the square with extra pieces of willow across the centre of the square. 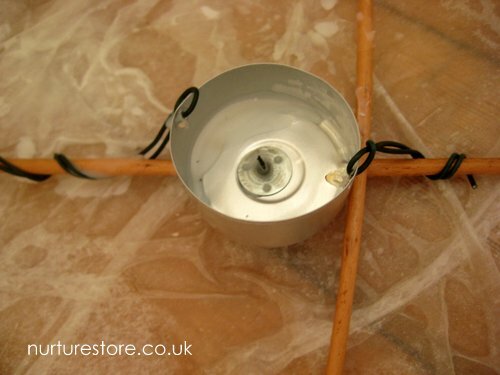 This cross is also where you will attach the candle to make your lantern shine. There were all sorts of wonderful lantern designs at the festival, but this is how the girls made theirs. 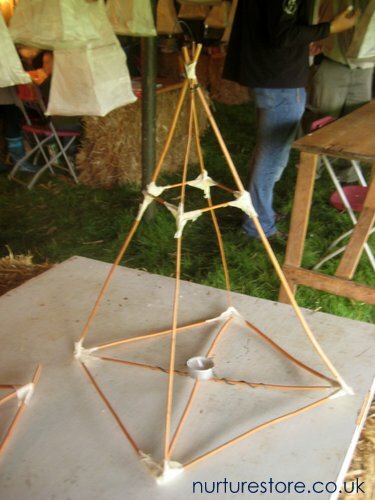 From the square base they used the thinner willow to build a frame, reaching upwards and fastened together at the top with more sticky tape. 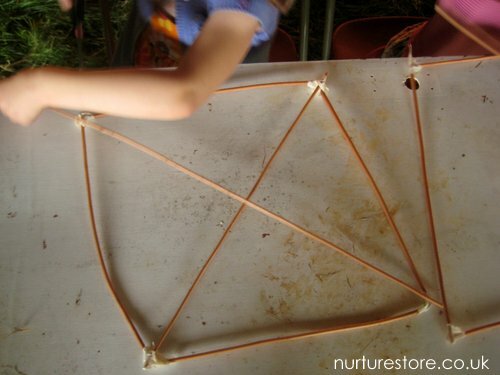 A tea candle was held in place in the centre of the crossed base with twists of garden wire. 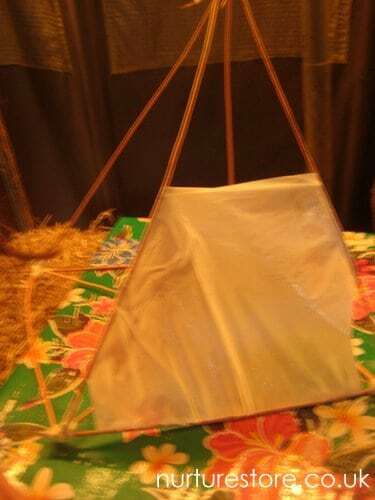 Once you’ve built your lantern frame, it’s time to add the paper cover. 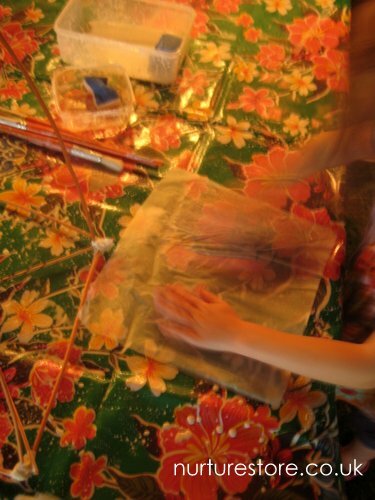 Use a plastic table cloth as a base and brush on a mix of half-PVA(craft )glue / half water. Place a sheet of tissue paper on the table cloth and brush over the top surface with the glue/water mix. The tissue paper will pick up a coating of the glue/water from the table cloth so it’s covered on both sides. If you have extra lengths of willow, you can loop them around at the top of your paper lantern for extra decoration. 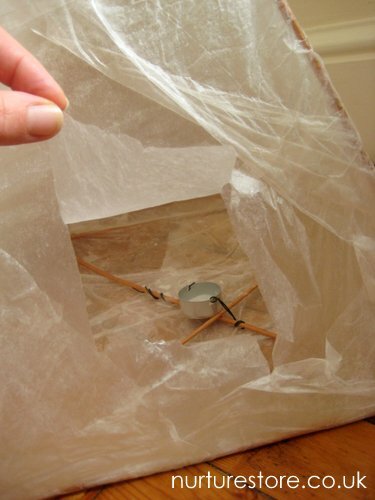 Leave the paper lantern overnight or for several hours so it can dry out completely. The tissue paper dries surprisingly taught. Once dry, use a craft knife or scissors to cut a window in one side of your lantern, near the base, so you can reach inside to light your candle. 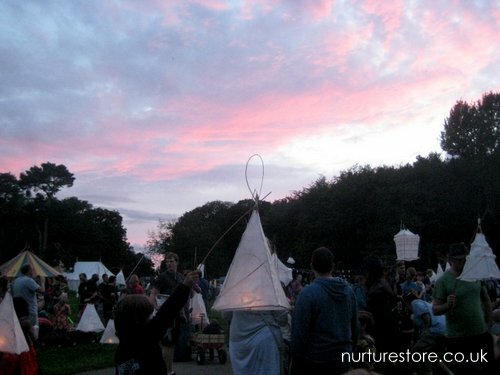 At the Just So festival, just as the last of the daylight left the sky, 360 lanterns gathered ready for the parade. Lanterns of all shapes and sizes joined in – many held aloft by sticks or plaited willow handles. The lanterns were beautiful, and surprisingly robust. Ours lasted the parade, two nights in a tent and the car journey home. The lanterns would be wonderful for a winter solstice event, or to light your way trick-or-treating at Halloween. 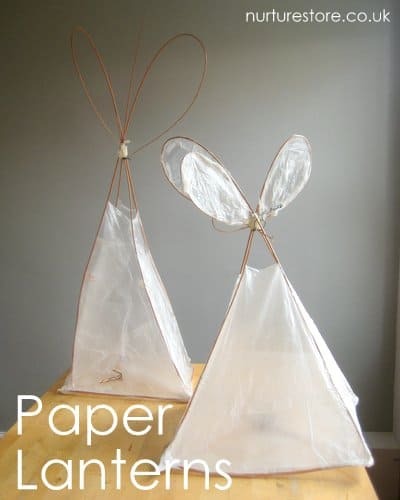 I bet they looked so magical, and are so simple to make! We went to the just so festival on the Sunday, and had a great time. Fantastic! We have a similar, local lantern parade on Halloween weekend, we’ll have to try this out. Thanks! Hi Valerie. I don’t know anything about French stores sorry, but you could try a Google search for tissue paper? you can use tracer paper use for publishing or printing purposes or the paper to wrap butter (may be in your areas). its thin and crispy paper thats strong enough to hold hot air inside. What joy is in the children’s faces. I wish so much to be able to travel to England. I live in Nevada USA. Wish we had events like this one, that can involve the family and the community coming together and having a lovely experience together. 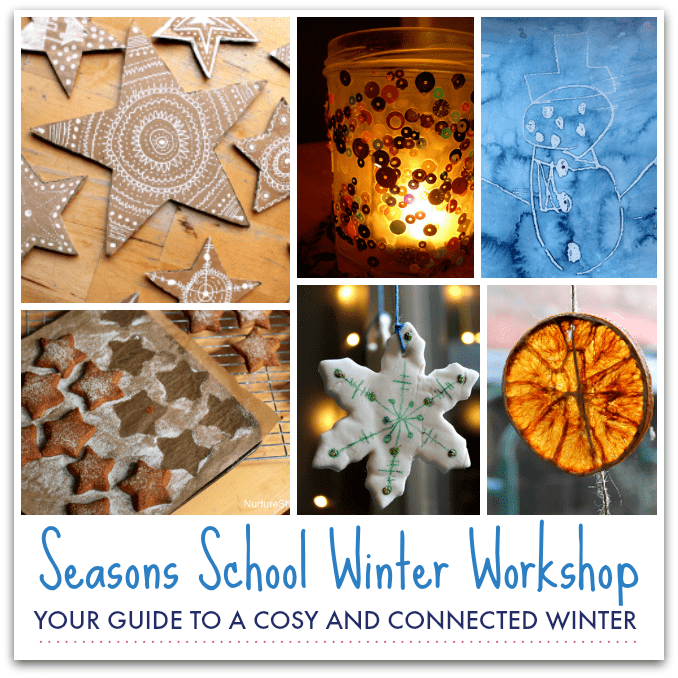 Looks like a bit crafty skills required… but the final product is intriguing me to make one…. You can do it! 🙂 You’ll have to let me know how you get on with it. Hi Carol. You might call it decorators tape, or Selotape? I am looking for a source for the willow reeds. Hi Sheila. Have you tried looking on ebay?